For the past week I had been looking for an opportunity to continue work on the latest table project, but unpleasant weather has been an issue. 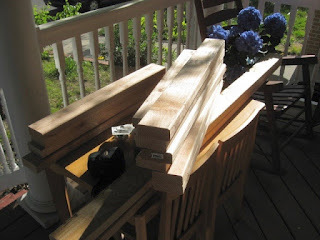 The previous table project had been done in an indoor studio, but the next phase of this one would be done on an open porch, and predictions for pretty much every day since I picked up the wood have been for precipitation. Today was expected to be a beautiful day, but I was committed to spending much of it in Belmar. However, what I needed to do wouldn't take long, so I called Mary in the afternoon, and she said she could be ready. 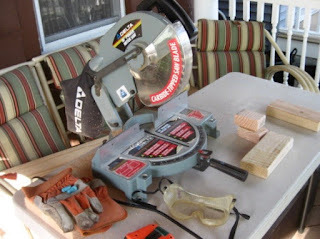 So at about 4:30 I got to her house and found the saw set up on a table on the porch. 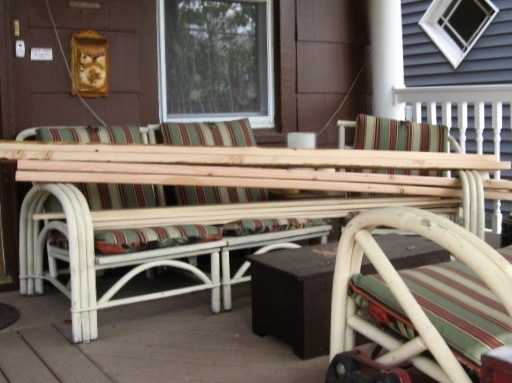 Got out the list of planned measurements and quickly transformed the pile of 2x4's to the pile below. What remains can all be done inside, so no matter the weather, I can continue the process next week. Had a couple of things coming together to push me to get this latest supermarket print going. One was that I had been asked to be an artist in the Belmar Art Walk, an annual event in town with artists in various locations around, making art, displaying art, or both. The other thing is that we have a critique scheduled next week, and I want to have something to show. My Kean class ends this week, so I had to get what I could from the book about the Bayeux Tapestry I had checked out and return it, which I did this past week. I have sketched this idea a lot on paper over the last year; above is recent one showing the effect of studying the tapestry. (the figure standing over the u-boat is very much a variation of boats being made for the Norman invasion) This past week I searched the tapestry for a model for someone hurling beets through the air- my substitute for the comet seen in the original artwork- below I was working out some of these ideas. 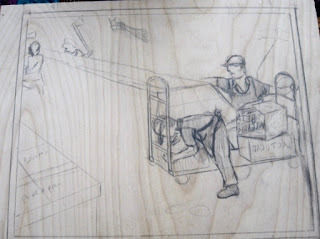 Today I finally started working (above) on the wood block. We've seen versions of the two figures on the right before, but these are more anatomically accurate, plus have the advantage of the correct wardrobe, some of which I have left over from my time working there. 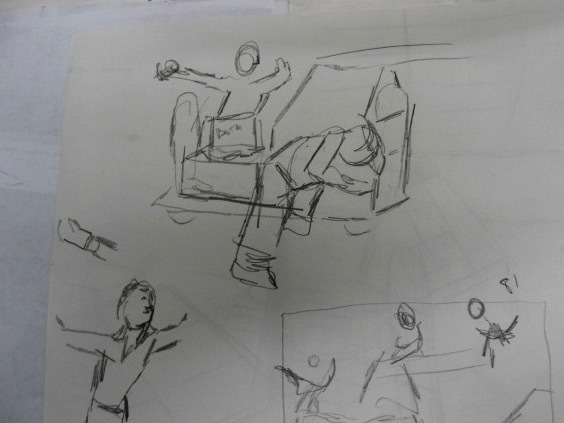 The two rough figures on the left are place holders right now, taken from a pair of soldiers facing off with battle axes. They fit well into the composition, but I'm not sure why the produce employees would have the axes. I'll think about that in the coming days. Below, today's drawing session was on location in the side gallery at the Boatworks, which was available and saved me the effort of taking out and setting up a folding table. I had brought a nice assortment of supermarket prints, plus my most recent block, so I could demonstrate what I was working on today. Have one more week of school left, and I still am waiting to hear about my latest attempt at a summer/part time job, so I am pursuing all options. I had mentioned previously that I am going to be back in the table business, and so this week I did some stuff in that area. As has been the case through much of 2016, my camera and computer are cooperating on a very irregular basis, so you get this information a few days late. On Monday I continued the process of building a sink support in Bradley Beach. For a dozen years I owned a pick-up truck and could carry lots of large items in the bed, but I traded that in several years ago. My current vehicle works well for most of my needs, and can transport a lot of what I need on a given day. 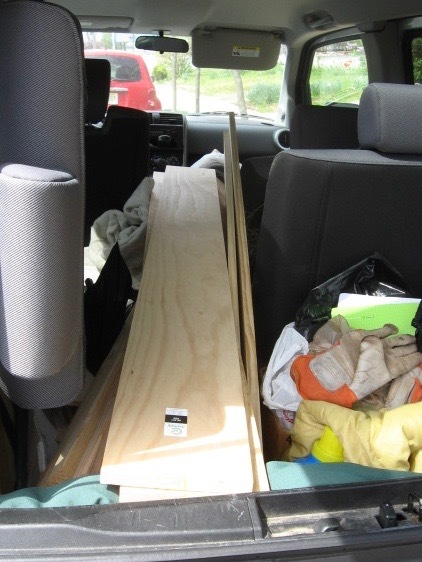 However, I had to inform my patron in this project that I would not be able to bring her with me to pick up the supplies, as carrying both a passenger and large pieces of wood is just not possible in this vehicle. So after stopping at her house for a last quick measurement and to show her the plan I came up with, we both got into our own vehicles and drove over to the store in Neptune. I was hoping they would have some 6 foot 2"x4"s in stock, since they would be easier to fit into my car, so I calculated my materials list for both 6 foot and 8 foot pieces of wood. It turned out they just had the 8' lengths, which required a little more rearranging, but I found a way to get it all into my car and to secure it for the trip back to Mary's house. Moved it all up onto her porch for now, and in a few days I'll be back to start cutting them to the proper lengths for my plan. Today I dropped by the Studio to pick up a few things that might come in handy. Mary tells me she has a mitre saw I can use, and most of the other tools I'll need are either in my apartment or in my car all the time, but some things were still in my Studio going back to when I was building tables there every day. 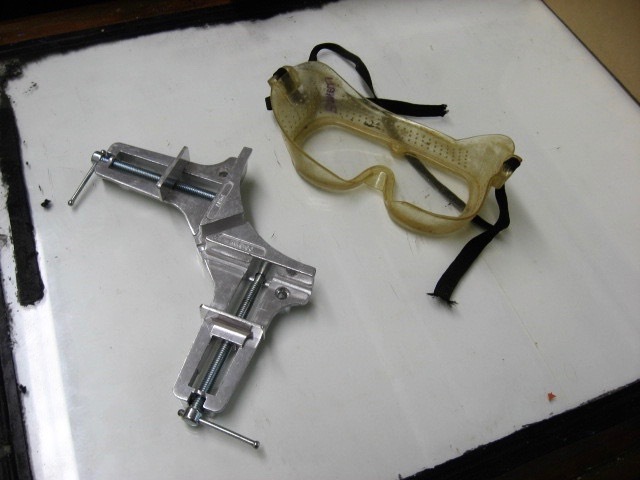 So today I picked up my right angle clamp and my eye protection. Have made some trips to Ocean Grove in recent days, not just to make art. 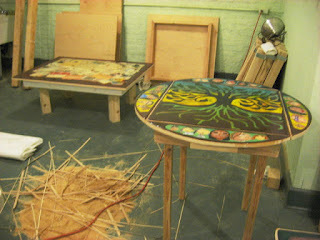 Since moving into the Jersey Shore Arts Center I have had some occasions to build furniture. 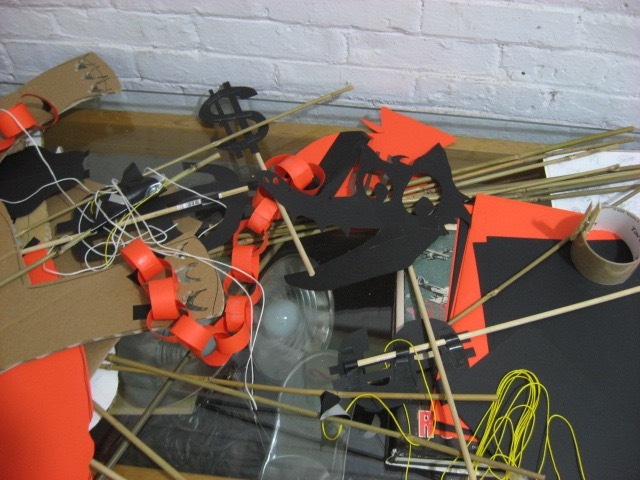 First it was building furniture for the Studio, which came with a desk and nothing else. Once we got permission to move into our room, I spent a few months making three large work tables, two large cabinet/shelf units, and a personal storage unit with a palette table. Nothing fancy (the furniture design students that I share my 3D classroom with can make much nicer looking finished objects), but solid and reliable. 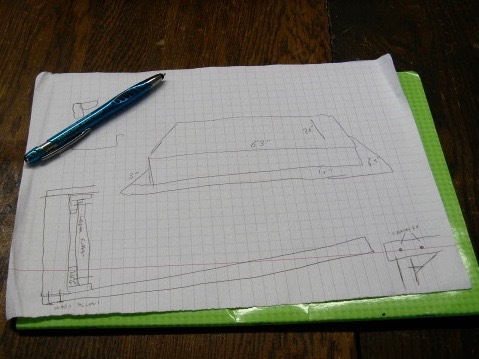 Several years later, Molly put together a grant to do a big community project involving the making of tables. 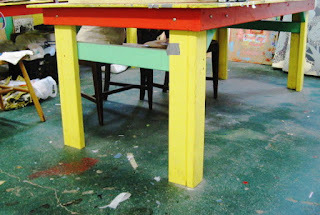 She had a long history of making carved and painted table tops, for private homes and businesses around Asbury, but putting them up on legs was a skill that eluded her, so she hired me to be the project carpenter. Being that this was a response to Hurricane Sandy, she wanted tables that could withstand a hurricane, and while my tables aren't fancy, they are very strong. Made 15 in the summer and fall of 2013, including the square coffee table and the round drop leaf table shown above. . Earlier this year I was approached with a request to return to my table occupation. Mary, one of my most regular woodcut students lives nearby in Bradley Beach and received a large (over 5 foot long) plastic sink basin. Right now it rests on an unneeded twin bed, but she'd like to put it to use in her studio and needs a sturdy wooden frame. She's got to hire someone to do that and decided to throw the work my way. With winter seemingly gone, it feels like a good time to finally deal with this, so a few days ago I made arrangements to stop by her house and check out both the sink and the space. Did some sketches. Once I get the final official plan finished I'll get the wood and hardware and go back to her house to build the thing. Above are some of the sketches from this week's visit. My trip to Ocean Grove today was for a completely different reason. A few days ago I had run into Brendan in the hall and he was talking up an artist professional development series the building has put together. A chance to learn a few things, to network, and to get a free meal. And since I had nothing else to do today, I decided to check it out. Although I work regularly with computers, I generally don't trust social media (today's topic), but I suppose I should learn more of this stuff. 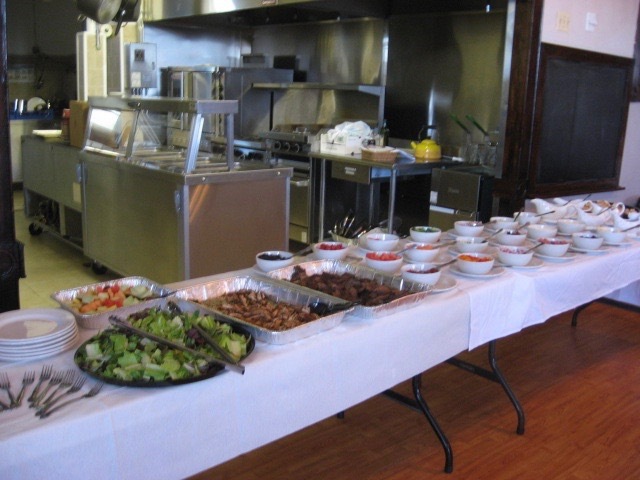 (I've been asked to take over the Belmar Arts Council newsletter next month, since it overlaps with a lot of what I cover for the blog I do for them, plus it's a paying gig) Lunch was a catered salad bar (good lettuce, chicken and beef, plus dozens of other toppings, dressings, etc, and cookies for dessert. We met up on the 3rd floor, the regular space for these kinds of events. After we all had our fill, the talk began, led by someone who has professional experience in this field. The main takeaway from this was that we should focus our advertising, and there are ways we can aim for specific markets (interests, locations, incomes, etc) to more effectively use our time and money. Not much time to deal with this stuff right now, but long term it could be helpful. Also took home a lot of leftovers, so dinner was also covered, and probably some free lunches up at the Studio if I drop by at those times. Exciting times right now in my neighborhood. Many months after construction was finished, the brand new Whole Foods in Wall opened for business. Still not sure why they waited this long (I think it could have been open for the holidays if they wanted to), but locals are very excited it's finally happening. It's across the road from the A&P/ACME I worked in for a chunk of last year (and still regularly shop), about 1.5 blocks from where I live. Didn't really need anything today, but I was curious as to what the place was like and what kind of stuff they will carry. Beautiful day today, so I saw no reason to drive, plus I expected a mob scene and a very full parking lot. And it was exactly as I expected. That plaza's very large and recently resurfaced parking lot was jammed full, with security types directing traffic and keeping order. And the store, larger than the average supermarket, was even more packed inside with shoppers. Getting through it was a challenge, but I persevered, hoping to find something interesting and worthy of a new woodcut. (the series is called "Scenes from the Grand Opening" after all, and events like today have inspired a few prints of mine over the years) Sadly, it was all pretty much what was expected- nothing worthy of being depicted in my series. At least I got a good sense of the store contents, though I don't expect to be back until the crowds are less. I exited, continued through the plaza to the Lowe's, priced a few things for my 3D class, then walked home. So no new inspirations today, but I have one in progress, and ideas for a few others, and as I keep shopping, I assume I'll see more things. Got word from Molly last weekend that she'd be ready to have the April critique this week. So last Tuesday I took care of the important task of getting some snacks. Stopped by to see my cheese guy and got a smoked mozzarella. I sometimes buy taralli there as well, they stock a good imported one and I usually get the fennel flavored. But last week they had a display of a new flavor- SPICY. What is it? 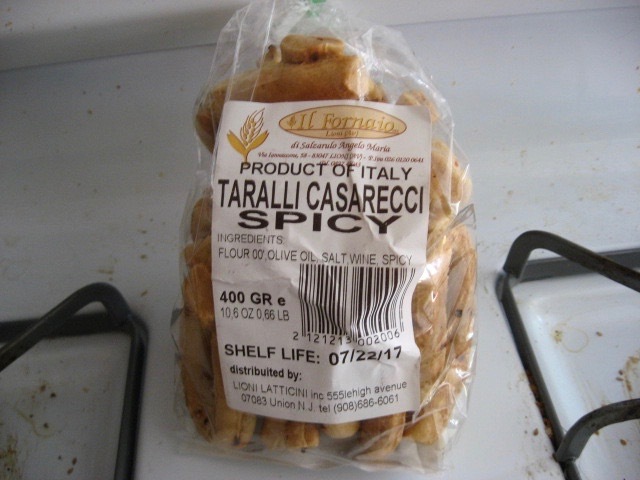 The ingredients list includes flour, olive oil, salt, wine, and "spicy". To keep it fresh I didn't open the bag until today. Still not sure what it is, but it is definitely spicy. I've been sending out e-mail reminders/updates for as long as we've been doing this group, but I think for the first time I didn't receive a single reply. Well, two were bounced back by the recipient's e-mail server, odd because these are the same addresses that have worked for years. At 7:00 pm I was still alone at my table. But then Molly arrived, and shortly after, two more regulars. Didn't do much critiquing tonight, more of a discussion. 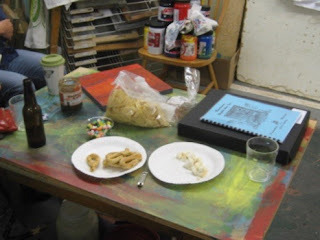 We put out the refreshments, Mary updated us on her adventures at the SGC in Portland (that black box above on the table is a print portfolio she participated in), but our biggest topic was around how to price artwork. 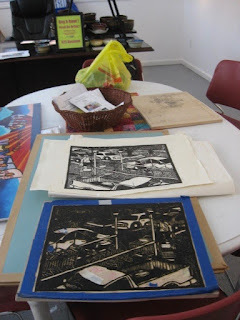 We all shared some of our experiences (and between us we all have a wide variety) and talked about various local art stories. No one had any finished pieces to show, but Molly had a bunch of things in progress. She had a recent opportunity to present her shadow puppets idea to a funding group, and showed us a photo of it. As with the last time, we all agreed that we like the idea, but there are still some technical issues to work out. She also showed a silkscreen image she burned into a silkscreen on Tim's behalf, and a drawing she was given by Gwen, but is still not sure how to proceed with. And with that, the two hours had passed. As I said, not much critiquing, but still a very enjoyable evening. Perhaps we'll have more finished art to talk about next time. The annual NCAA Men's Basketball Tournament wrapped up on Monday night, but life kept me too busy to do my update until tonight. In this final weekend I had two of my art schools make the Final Four, and 3 of the schools I picked for the Final Four on my brackets still active. On the first night, the one team I hadn't picked, Syracuse, was also one of my art schools left. They had gotten further than anyone had expected, but they finally lived up to their #10 seed. On the other hand, Villanova absolutely crushed their opponent in the semi-final, expanding their lead to 40 points before it was over. The final round match on Monday was much more competitive, with North Carolina getting a 3 point shot that seemed to be an accident, to tie the game with 4 seconds left, then Villanova getting back down the court to win it with their own 3 point shot. Made me happy for two reasons- first I had to get to bed and didn't want to wait through an overtime period, and second because I had picked the winner (and their opponent) in my brackets, which I have since read very few other people had done. Plus, it was one of my art schools. 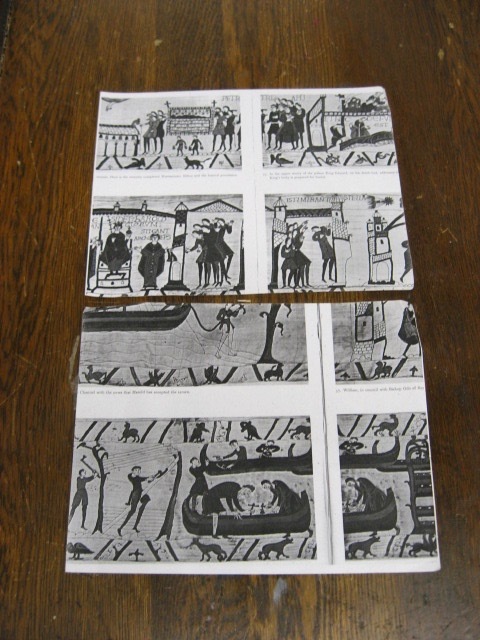 When I first had the idea to link an employee argument in produce to the Battle of Hastings, I borrowed a book from one of my school libraries and made some photo copies for future reference. Those copies disappeared for a while, but I found them earlier this year when I started thinking about the next print. 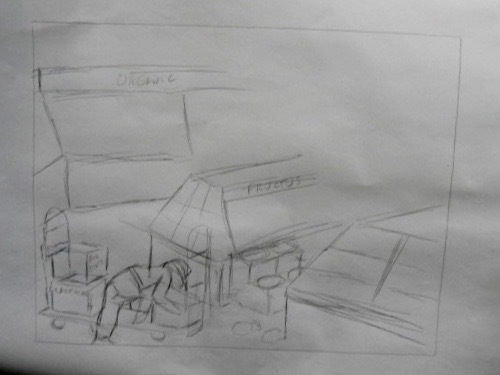 Last year at times I started doing little sketches of the produce department, to be used in creating the setting, but set those aside when I started working there. But that ended a while ago, and it's time for a new print. Months ago I mentioned the concept to my critique group and someone suggested the idea that I could replace the comet (second panel down on the right side) with a vegetable, maybe something in the onion family where the stem had been allowed to grow long, which planted the idea in my head to consider other visual links between the Bayeux Tapestry and the produce section. Since I am getting serious about finishing this piece, I took out the copies and looked for other ideas. I found a few other possibilities. 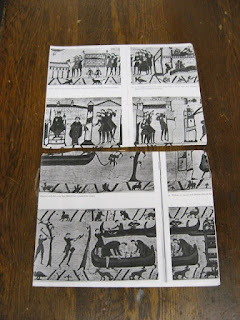 In the bottom photocopied page above are a few images of boats being made, I assume by the Norman invaders. 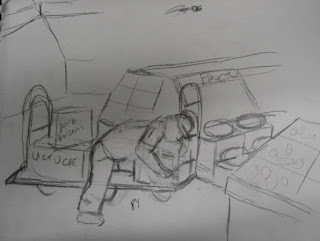 We don't have an invasion fleet at the supermarket, but all supermarkets have plenty of u-boats, which seems to be the common name for those long, narrow 6 wheeled carts with the tall handles at either end, used to move materials all throughout the store. In my deli days, I was sometimes assigned to work "the load", where one of these carts was packed with cases of stuff destined for our department, now parked inside the walk-in fridge, and it had to be unpacked, dated, and rotated within our storage system. In some cases is was felt that I'd be the best person to do this, as most of the deli employees were retired senior citizens and said they couldn't handle the cold conditions. 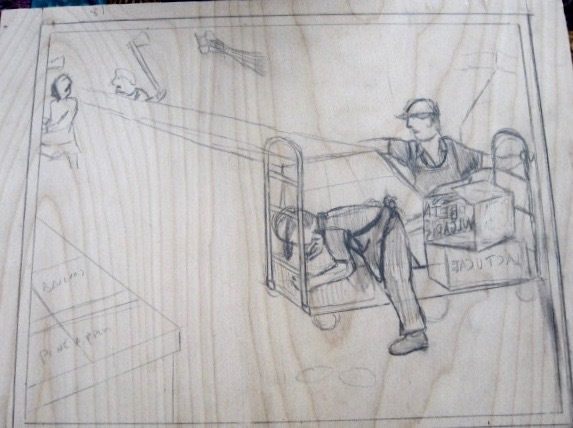 So in reworking this store scene, I added a store employee straddling the u-boat, cutting open a box, not unlike the Normans using axes to hollow out their boats. Never saw severed heads in the supermarket, but perhaps a loose pineapple, fallen from a display will work. As for the comet, in the store the other day I saw bundles of organic gold beets, complete with stems and leaves, looking very much like the comet. Why it would be flying through the air I have yet to figure out. 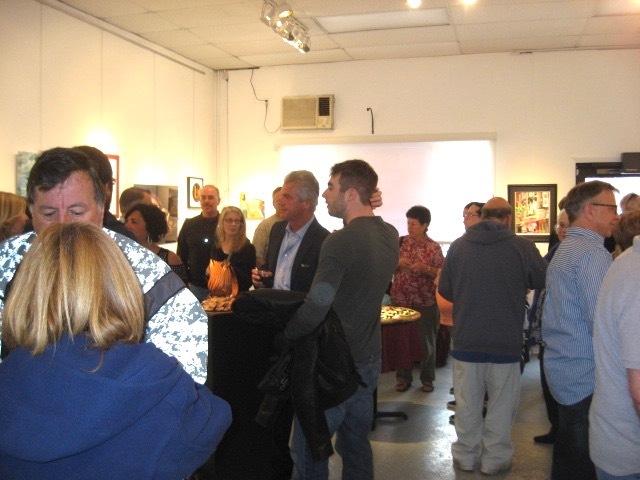 Tonight was the opening reception for the 12th Annual Juried Art Show at the Belmar Arts Council. Our most popular show in terms of entries, and also in terms of attendance- we are estimating at least 250 people coming through over the course of the reception. Very hard to look at the artwork under the conditions. 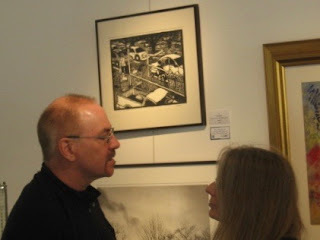 Above you can see my piece, which if not hung up high, would be hidden behind the viewers. The show remains up through May 6, 2016. More photos from the event can be seen at the Belmar blog.